I have promised one of my readers, Ma Vie..Ma Joi, to write about this topic. Especially since I now have that travel advice service, whats better than to share with all rather than email individuals about this. My dear reader mentioned how she prefered shorter trips to gorgeous destinations. Ok so that excludes exotic places like Maldives, Bora Bora, Seychelles, but people, we actually do have great places here in the Gulf area! And I'm meaning to visit every one of them, with family, with friends, with spouse. 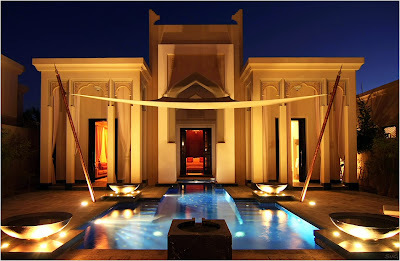 1- Banyan Tree Al Wadi- Ras Elkhaima, UAE. Just recently opened. Who can ever guess that Ras Elkhaima has a heavenly oasis in its dessert such as this resort. When I used to study in the UAE, I never once thought of visiting that area. Mentioning that Im so in love with Banyan Tree resorts, this must be one of my favorites. You know by Banyan Tree AlAreen (opened since 2007), but has changed the name due to Banyan Tree terminating its management to the resort due to some problems. 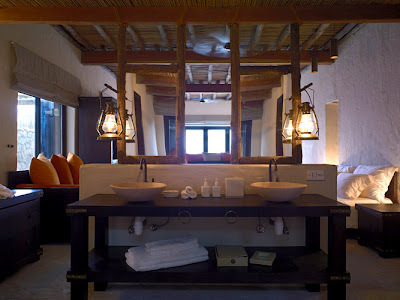 3- Six Senses Hideaway Zighy Bay- Oman. Ever since it opened in 2008, I've been only wanting to visit that resort if I ever had the chance to go to Oman. Mom has been to the country a lot of times, talks endlessly of its natural beauty, but wasn't interested in where this resort was located, far away from the capital. But thats the whole point. 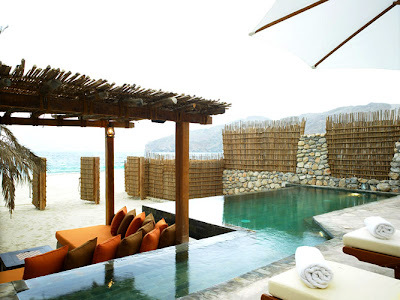 Some of the villas have direct access to the beach. By the way, its only a 90 min drive from Dubai International Airport! Friends of mine just got back from Zhigy Bay..they highly recommend it for zoning out of this world ;) I want to go there, it all depends of work though :s and it is a 2 hour drive from Dubai.